The Vineyard Gazette - Martha's Vineyard News | What Color Is the Passage of Time? 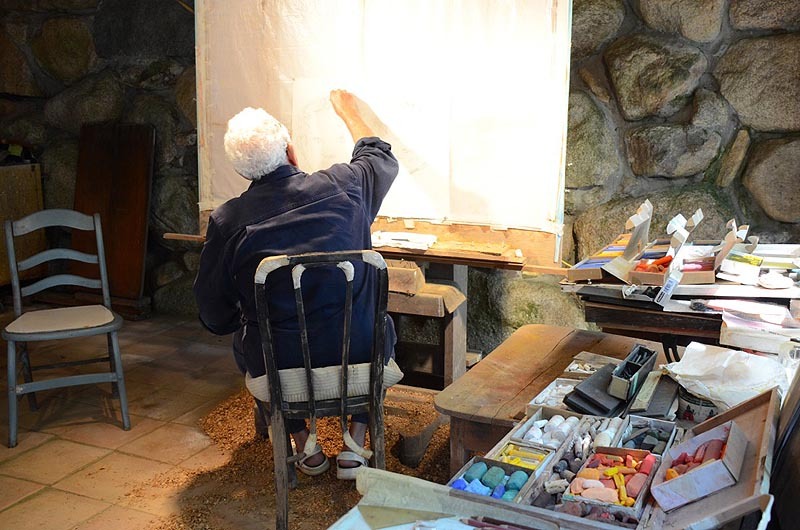 Irving Petlin at work in his studio in Chilmark. What Color Is the Passage of Time? Within the ephemeral confines of time, the value of a place that provides refuge from a tirelessly moving reality is always a welcome respite. 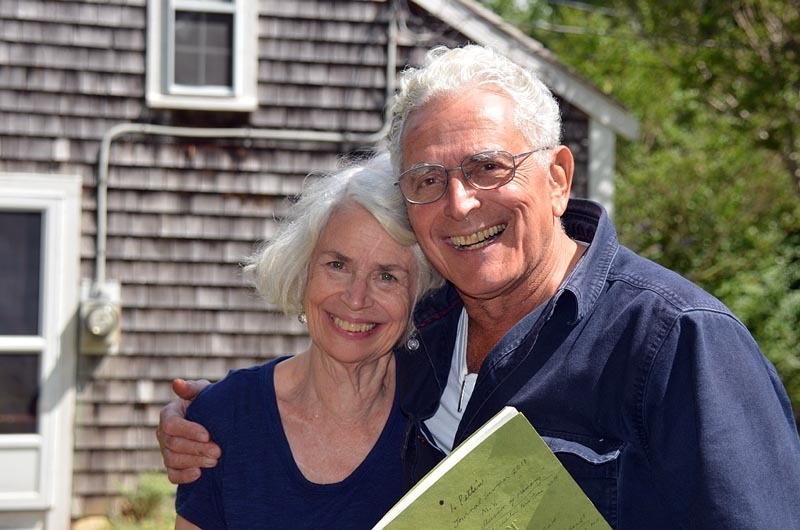 For artist and painter, Irving Petlin, Martha’s Vineyard is that place. At his basement studio in Chilmark, the sounds of nearby South Road fade behind the shelter of double-glazed glass doors. Bits of effervescent color lie restless in their boxes. In his 55 years of creative endeavors, Irving Petlin’s work has carried him from place to place: his childhood home in Chicago, art exhibitions at the Museum of Modern Art in New York, to his studio in Paris overlooking the city and a sea of rooftops, chimneys and spires. Mr. Petlin has made an annual pilgrimage to Martha’s Vineyard with his wife and children for 38 years. And yet he has never had an exhibit on the Island — not until this weekend when his show, Mythology and the Island, opens on Saturday, August 23, at the A Gallery in Oak Bluffs. There is a reception from 5 to 7 p.m. on Saturday, and Mr. Petlin will give a talk on Wednesday, August 27, from 6 to 7 p.m.
A trickle of an idea began to percolate. It is this momentary pause in the passage of time that the artist returns to over and over again, reflecting on the journey that brought him to the shores of this Island. His work, from the medium through the process to the product, falls into a cohesive web of culture and continuity. 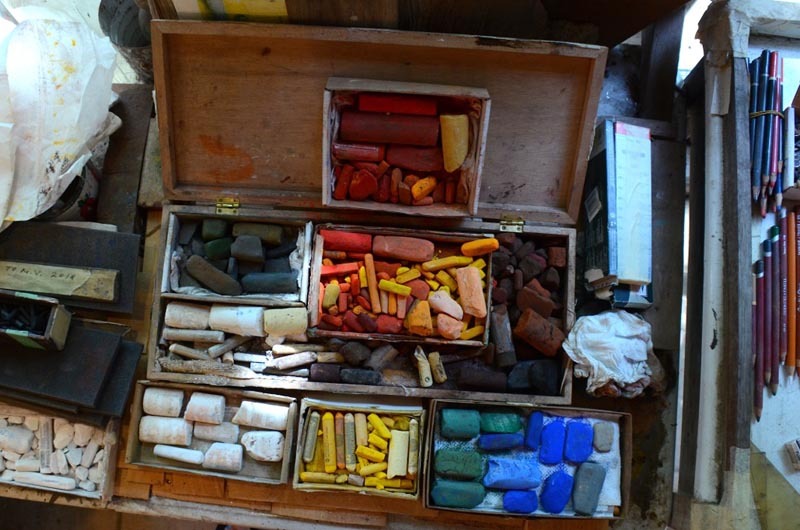 The pastels he works with carry with them an historic weight that brings an added value to the color they create. They are made by the House of Henri Roche, one of the oldest and most prestigious producers in all of France. Although colors are a constant, Mr. Petlin’s surroundings haven’t always been the subject of their hues. The exhibition carries with it an understanding that time passes. In Mr. Petlin’s work familiar structures appear and reappear in the haze of his color-strewn backgrounds. Never quite the same but not starkly different, his world of memories, recollections and realities distill rather than instill an understanding that experiences are abstract. The figures who populate this world morph and grow, their appearances ebbing and flowing with the tide that carries these travellers onward. The A Gallery is located at 8 Uncas avenue in Oak Bluffs. Call 917-378-0662 or visit agallerymv.com for more information.